The Plot: Dawn, 11, is the type of kid no one notices. She waits to be noticed; by the crossing guard, by teachers, by classmates, by her parents. When someone does notice her, it's a bit of a surprise. She's been recruited by a super-secret spy agency. Not being noticed is a good trait for a spy. The Good: This book brings on the fun with a lot of humor, both over the top and subtle. The spy agency is S. H. H. (Strictly Hush-Hush); Dawn's been recruited for the P. S. S. T. (Pursuit of Scheming Spies and Traitors) division. Dawn is given a phone that is made to look like something else so that people won't realize when she's talking to spy headquarters. It's shaped like a shell. A shell phone. That cracks me up. It's the type of humor found in the Harry Potter books,; fans of HP (especially those who aren't fantasy readers) will like DU. Dawn begins feeling invisible; who hasn't? Dawn is the type of kid I think of when I think of libraries and books; the quiet, invisible kid. Sometimes when I'm in meetings or reading articles about the kids who don't come to libraries, and outreaching to them, I get a bit worried that we're forgetting the kids who do come to the library. Because we cannot ignore the Dawns, who come here without outreach, who we may not notice, but who need us. Dawn isn't cool. Reading how she dresses is a hoot; she's about comfort, with her favorite sneakers and knee socks. She may not want to be invisible, but she's not out to get popular. She wants to be seen, to be noticed, to be important. But she isn't about changing who she is to do so. Dawn is wonderfully average. Not super smart, super skinny, super rich. I love that she discovers that her ability to notice things yet not be noticed is a good talent to have; that she can save the world. Or at least, save a captured spy or two. And, of course, it has my favorite elements of a kids book: Dawn is active, not passive. She solves the mystery by hard work, not by coincidence or luck. 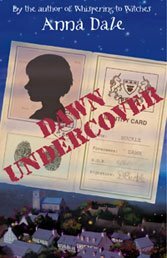 The reader can follow along and try to solve the mystery with Dawn. The Getting Rid of Parents device: the parents give permission for Dawn to go. A recent article in School Library Journal is about Disappearing Children's Books, with the observation that good books for children ages 8 to 12 are disappearing because edgy YA books get the most attention. As I read it, I saw a parallel: just like Dawn is the great kid who doesn't get noticed, middle grade books are great books that don't get noticed. DU is a great addition to middle grade books, and perfect for that age group. I thought that book was lots of fun to read as well. I liked Dawn, too. And I think that your parallel between the disappearing Dawn and the disappearing middle grade novel is well put. This sounds cute. I liked Whispering to Witches.